Maven and Richard got married on a beautiful sunny day at Gosfield Hall in Essex. 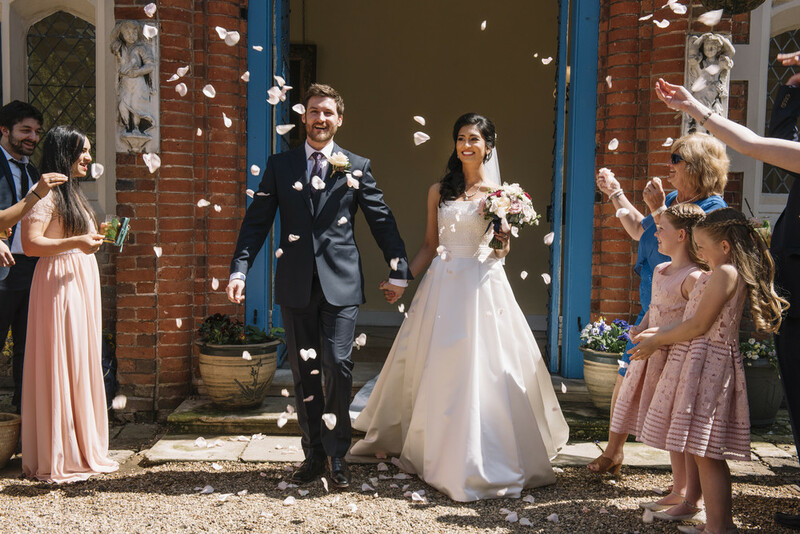 Set in 10 acres of manicured gardens and parkland, with views across the Essex countrydie, Gosfield Hall provides an elegant backdrop for a glamorous wedding. Maven started the day getting ready with her bridesmaids in the oppulent Rococco style Bridal Suite, before slipping into her first gown of the day, a stunning silk tafetta ballgown with beaded bodice and full princess style skirt. Following a drinks reception and photos in the extensive grounds of the hall, Maven changed into a beautiful cream sari with intricate lace and sparkling beaded details. We love an outfit change in a wedding, especially when two cultures are coming together to share in the celebration and the couple wish to honour both. The reception took place in the grand Ballroom, with double-height mirrors and crystal chandeliers. Maven and Richard decoated the ballroom with touches of blush pink, as seen in the bridesmaid dresss, and blooming english country garden style arrangements on the tables and above the fireplace. Following dinner, photographer, Emma-Jane Photography, made the most of the perfect 'golden hour' which graced the evening and took some jaw-dropping couple shots in the grounds of the hall. If timings are right and you can sneak away after dinner with your photographer to capture this part of the day we highly recommend it!